Freshman Brysonn Aulbach pins his opponent in the Michael Young Memorial Invitational. 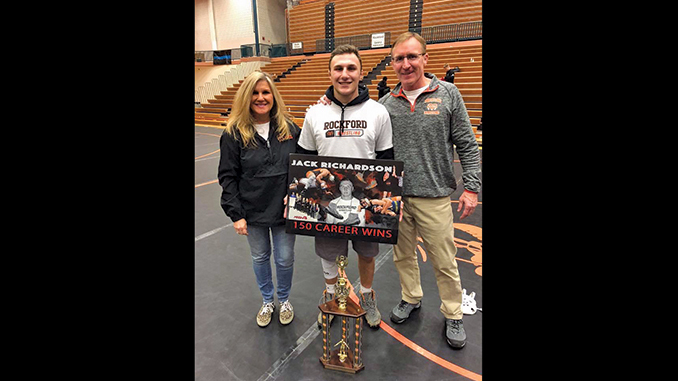 Senior Jack Richardson celebrates his 150th career win with his parents Caroline and Brian Richardson. Then the Rams had to come up big several times in the championship against Whitehall who is ranked #2 in Division 3. Richardson noted, “These are duals where every match makes a huge difference. How each of our wrestlers wins or loses makes all of the difference. 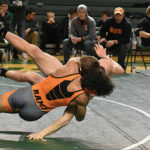 Our kids ‘got it.’” For example, senior Jack Tadych (135) had a come from behind win, and sophomore Cole Gleason pinned his opponent who is ranked in the top ten in the state. 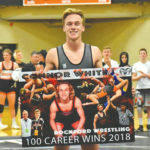 There were also some important losses that minimized Whitehall’s points; Jacob Slabaugh and Taylor Green each gave up only decisions to keep the Rams in contention. Ultimately, the team title came down to the final match of the day. Junior Ashton Halland (119) was evenly matched with his Whitehall opponent. It was a back and forth match that had the entire gym electrified! In the third period, Halland secured control and turned his opponent to his back and earned the pin to settle it once and for all. The Rockford contingency went crazy with the win, giving the Rams the title. Coach Brian Richardson was in awe of Halland’s performance. “Ashton works his tail off. He wants to be elite. His come from behind pin was incredible!” Indeed it was an electric atmosphere highlighting the simple beauty of high school wrestling. Senior Jack Richardson had a notable achievement Saturday also. He notched his 150th career win. This puts him in a truly elite club in the state of Michigan. Looking ahead, the Rams will host West Ottawa on Wednesday which is also Senior Night. 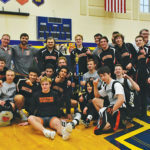 If things go well for Rockford, it will set up a clash with Hudsonville for the conference title at home on January 23rd. This Saturday, they will be competing in the Lakeshore Superduals at Stevensville Lakeshore. The Varsity B team will be wrestling at the Jenison Invitational.